Indeterminate from the Bible reference. I have set the scene in the late morning. The sun is fairly high in the eastern sky (the left of the scene) casting shadows to the right. Mary (mother of Jesus) riding a donkey among a caravan of other travellers. A shepherd is playing a flute-type instrument, surrounded by his sheep. In this scene we can see Mary (the mother-to-be of Jesus) riding a donkey in the foreground, looking towards the flute-playing shepherd. In the background we can see a village or town, which Mary is making for. 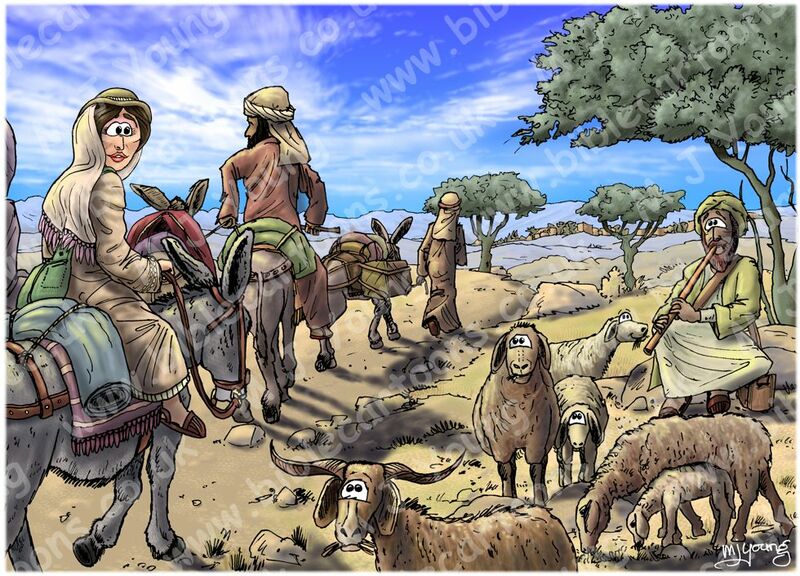 As I explained in earlier scene notes, the name of the village or town is not specified in the Bible. Various commentators believe the place may have been Hebron. It is not explained in the Bible why Mary decided to go & visit her relatives Zechariah & Elizabeth. We know Mary & Elizabeth were related, since the angel Gabriel said that much (see verse 36). Hebron is 81 miles (130 km) almost due south of Nazareth. I’m guessing the roads in first century Palestine probably weren’t direct either, so this would have been a major undertaking for a young girl & probably a journey taking several days to complete. Bearing in mind the presence & menace of bandits & other hazards, it is likely that Mary travelled amongst a caravan of fellow travellers, perhaps traders or merchants. 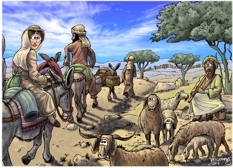 That is why I have drawn her with other people, riding/leading donkeys. I imagine this is the only way Mary’s family would have allowed her to make such a great & potentially perilous journey.